Halloween in Georgetown is what it is today because of Linda Roth and Mike O’Harro. In Part Two of a Two Part Series, Our Town host, Andy Ockershausen, learns the tricks of the trade and gets the inside scoop from the queen and king of DC nightlife themselves! Listen in to learn how Linda Roth and Mike O’Harro began opening restaurants and bars to make the DC night scene full of life and energy. You can listen in to Part One of this series here. 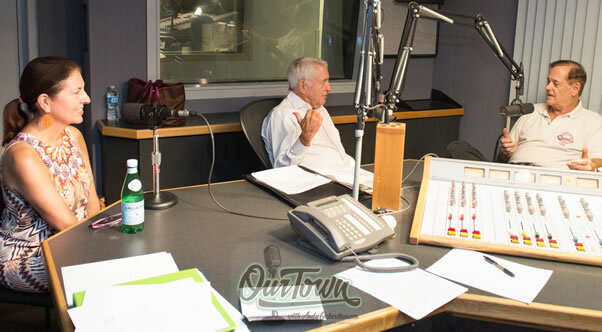 Our Town host Andy Ockershausen dives deep into conversation with Linda Roth to uncover her humble beginnings here in Our Town and follows her journey to the successful “go to” woman in publicity that she is today. In the late ‘70s, Roth came to Mike O’Harro’s night club to interview for a management position but was instead hired to be the editor of the International Discotheque Association and together Mike and Linda proceeded to mold the nightlife of DC. Linda recalls being a huge part of making Halloween in Georgetown what it is today. Additionally, due to the large number of important celebrities coming into Tramps, Linda was also hired as a gossip column hostess. Linda Roth has been responsible for opening over 200 restaurants in the Washington DC area. Today, she is the President and Publicist for her own agency, Linda Roth Associates, Inc. Major hospitality groups such as Marriott Hotels & Resorts, Starwood Hotels & Resorts Worldwide, Hilton Hotels & Resorts Worldwide, Morton’s The Steakhouse, Brinker International, Carlson Restaurants Worldwide, Restaurant Associates, Guest Services, Inc., Lettuce Entertain You Enterprises, Del Frisco’s Restaurant Group,The Sports Club/LA and Krispy Kreme have sought her out for public relations assistance through her current company. Linda firmly believes in supporting charitable causes and has served on the board of DC Central Kitchen, an organization that helps Washington, DC’s homeless population. It’s an honor to have Linda Roth on Our Town as we follow her DC career to learn how she has become a major contributor to the development of DC’s nightlife and a present-day marketing and publicity strategy wizard. We hope you enjoy listening to Linda Roth discuss her perspectives of Our Town with host Andy Ockershausen. We invite you to listen to Part One with Our Town guest Michael O’Harro this week, Tuesday, October 25. We also invite you to listen to each new episode of Our Town as they roll out over the next several months. You can subscribe to the Our Town podcast on iTunes, Google Play, or if you complete the subscription form in the sidebar to the right you will be notified by email when the next episode appears here on the website. Great memory infusion. I love the podcast! Thank you for coming up with a great broadcast! Andy and janice you both are class acts! Hi Scott! Thank you, we’ve been talking to a whole lot of people, several of our guests have mentioned Elliott and Woodside!